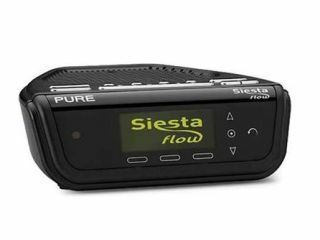 Pure has announced the arrival of the Siesta Flow radio, a device the company is calling the "the world's first internet connected bedside radio". While this is not strictly true, we're thinking Pure is talking about the fact that the device can play web radio stations AND wake you up in the morning. The radio uses Pure's 'Flow' technology, which brings all the functionality you would expect from a Pure radio – DAB, DAB+, FM – and also provides access to 365 different alarm tones via Pure's on-line portal, the Pure Lounge. This is so you can have a different alarm every day for a whole year. Other features include: a large auto-dimming display; touch sensitive controls; four quick-set alarms; sleep and snooze timers; 30 DAB/FM presets and an auxiliary input for an iPod. Oh, and you also get Wi-fi connectivity. If you want to know what some of the sounds you can use for an alarm are, the wonder no more as Pure informs us you can have everything ranging from sleigh bells to a submarine beep to a fog horn. Siesta Flow has a release date of 'before Christmas' and will be available for £99.99. Go to www.pure.com for more details.